Helen tells Beth and Cam that they have to move out of Number 32 so the Martins can move in. Bouncer has carried in a dead animal. It's Gus - Hannah's guinea pig. Lou has something special planned for Stephen's bucks party. Brad has got the bar manager's job after Phil saw him deal with a drunk patron. Cameron is pleased that Helen evicted them from Number 32 because he's always wanted to live somewhere with a pool! Lou says he's taking the day off and Benito can look after the car yard - he needs the practise! Beth quizzes Cam over Heywood and how the investigation is going. Cameron says that if he doesn't get a story out of it soon, he'll have to give up because he's running out of money but he thinks he will turn something up. Beth leaves and Lou tells Cameron that he's booked someone called Serena for Stephen's bucks night - apparently she's very "talented"! Stephen and Phoebe are trying to organise things for the wedding. Stephen has organised the honeymoon but he won't tell Phoebe what's going to happen. Dorothy worries that they've forgotten something. Toby thinks that Stephen will be wasted for the wedding! Stephen is sure that he'll be fine and no stunts will be pulled on him. Julie is packing some toys up for homeless children. Hannah is clinging onto her doll, Muffy and is reluctant to pack her toys up. Michael is scathing about Hannah's attachment to Muffy. Phil walks in and calls Julie over to him - he's got dead Gus in his hands! They both realise Hannah will be upset and Julie instantly accuses Michael. She ignores Phil's protests and calls Michael over. Julie thinks it's Michael's sick idea of a joke but Michael says it isn't his doing. Phil thinks they should forget about it - he doesn't want Hannah being upset. He leaves for work, saying he'll deal with the body of Gus. Phoebe, Toby and Dorothy are settling down in the Coffee Shop. 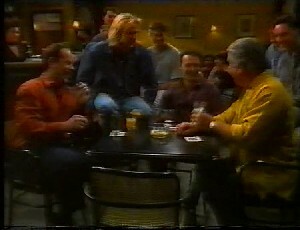 Stephen tells them to order a drink - he's got an errand to run. Phil and Gaby walk in and Gaby is hassling Phil over his decision to give the bar manager's job to Brad. GABY: You told me the only reason I couldn't have the bar manager's job was because you were going to do it yourself. PHIL: I was. But I found I'd bitten off more than I could chew. I wasn't spending any time with my kids! 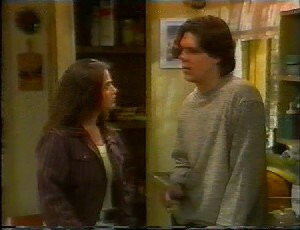 GABY: Well then is there any reason why you didn't make me the bar manager instead of my little brother? PHIL: I'm sorry, Gaby - I just happen to think he's the best man for the job. It's as simple as that! Gaby leaves and Phil asks how his new next door neighbours are doing. Phil is stoked that the Martins have their own house again but mentions that Hannah's upset because her guinea pig died. Dorothy, Toby and Phoebe look uncomfortable. Phil tells them that Gus died of a virus - he rang the bloke who sold Gus to him and apparently a whole bunch of them died of the same thing. Phil explains that the weirdest thing has happened - they had a funeral for him and Phil buried him in the garden of Number 26 but he found him this morning in the back garden of Number 32. Phil walks off and Dorothy, Toby and Phoebe look even more uncomfortable! Brad and Beth are discussing Gaby and the bar manager's job. Brad thinks that he will just let her have the job instead of taking it himself because she wants it so badly. Lou is still going on about the bucks party. Lou won't give any details out in front of Beth. Beth goes into the kitchen and Cameron's not getting anywhere with getting dirt on Gavin Heywood. He's still determined to get to the bottom of everything and plans to break into Heywood's offices to look around. Brad goes in, clearly about to offer the bar manager's job to Gaby. Gaby's in a bad mood and interrupts him. GABY: You know why Philip made you bar manager? He said it's because you're the best MAN for the job. GABY: Don't you get it? The fact is he'd rather have a man in charge of the pub even if he had a woman who's ten times more qualified! BRAD: What a load of garbage. Why don't you just cool it for a sec and listen to what I have to say? GABY: Just tell me this - am I better qualified or not? GABY: Now who's talking garbage?! BRAD: Ok, why do you think you're so much better for the job? GABY: Because I have been spending the last year managing my own shop and the year before that doing a top business course, that's why! GABY: So?! While I've been working my guts out all you've done is play basketball and surf! Besides, you're as thick as two short planks! Brad is furious. He tells her he was going to let her have the job but now she can forget it. Gaby angrily yells after him that the job should be hers and she will get it back off him. Hannah is clearing up and shifts Michael's feet to get some newspaper. MICHAEL: Can't you go and play in the traffic or something? Hannah protests that Michael should help clear up too. Julie agrees and Michael hassles Hannah, pulling her hair behind Julie's back. 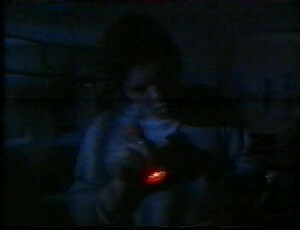 Hannah finds Michael's cigarettes and dobs him in. Julie is annoyed and grabs them off Hannah. She rebukes Michael, asking him if he's proud of the way he got expelled from school. She tells him to stop being a devious little sneak and goes to hang out the washing with Hannah, leaving him to clear up by himself. He grabs Hannah's doll, Muffy and twists its neck. Dorothy, Toby and Phoebe are laughing at how they didn't realise Bouncer had dug Gus up and not killed him - especially as they put him back in the wrong back yard! Toby wonders if they should've told Phil the truth. DOROTHY: No! He might find it funny but Julie wouldn't! Dorothy says it should remain their secret, just as Stephen returns from his secret errand. He gives Phoebe tickets to Samoa - 10 days in one of the best hotels for their honeymoon. He's spent the money that he had been saving for a car. Michael is "mending" a chair in the living room. (This seems to involve smashing it against the floor and waving a screwdriver around. This boy became a carpenter?!) Julie comes in and asks him what he's used to fix his "hideous" posters to his bedroom wall. When she finds out it's sellotape, she tells him that they'll ruin the walls when they take them down. Michael is confused as to why they have to come down and Julie informs him that he's going back to a new boarding school as soon as the holidays are over. MICHAEL: Oh, you think so? JULIE: I know so. You may have convinced your father that you didn't get yourself expelled from boarding school on purpose but you don't fool me for a minute! So I wouldn't bother making yourself too comfortable here if I were you. 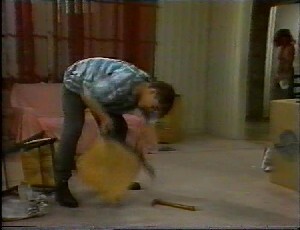 Julie walks out and Michael turns his attention back to smashing (sorry, "mending") the chair. Dorothy is going to a gallery night with Helen. She offers to stay with Phoebe, who is feeling ill but Phoebe is going to have an early night. Toby angles for an invite to the bucks party but Dorothy is insistent that he is staying with a friend instead! He wants a full report off Stephen afterwards. Stephen offers to stay with Phoebe but she tells him to go. STEPHEN: In that case, I'll see you at the Church. Beth has arrived to babysit Hannah - Phil's off to Stephen's bucks night and Julie is going with Dorothy, Debbie and Helen to the art exhibition. Phil tells Beth to ring him at the Waterhole if there are any problems and the two of them leave in a hurry. Phil comments as they're leaving that Michael should wander in at some stage, although neither her or Julie seem to know where he is. Brad, Phil, Stephen and Lou walk in with a bunch of men that no one has ever seen before (or since). Lou is in high spirits and Phil says that Jim will be down in half an hour - he's gone to talk Doug into having a shower and joining them. Brad goes to the bar where Gaby is on duty. BRAD: Hey er, Gab - the fellas would like a couple of jugs and don't go dropping any of those or I'll have to deduct them from your wages. BRAD: Er and it's, "Yes, boss," from now on! The phone goes and Gaby takes a message for Lou - apparently Serena is on her way but she's a bit late. Brad wonders who Serena is and Lou says that they have never laid eyes on such entertainment. The boys are in very high spirits now! Brad wonders when the other lads are arriving and where Cameron is. Lou says that Cameron has something else to do. In the dark, Cameron is breaking into Heywood's offices. He snoops around in the dark with a torch. He seems to hit the jackpot with a file when the lights come on. Hannah is looking for Muffy but can't find her anyway. She thinks that Michael has stolen her because she dobbed on him for smoking. She thinks that Michael's taken the doll to his hideout - the old spooky house behind Lassiter's. She begs Beth to take her there to get Muffy because she can't sleep without her. Beth refuses. Lou is telling a joke and the lads are in a good mood. Phil goes to get more beers and Stephen rings Phoebe to see how she is. Stephen tells her that it's pretty quiet and he'd rather be with her. He says he's not in the mood for getting off his face so he's going to slip off quietly in a while and go back to Phoebe. Beth and Hannah go into the cottage. Beth yells Michael's name but he doesn't answer. Hananh thinks that he must be there because it smells smokey. Beth agrees but says that it doesn't smell like cigarettes. They walk through the house because Hannah thinks that Michael's probably hidden Muffy. Hannah trips over and hurts her ankle. 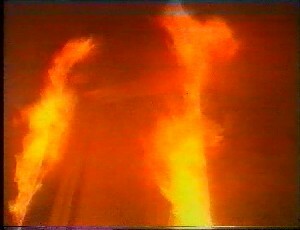 As Beth gets her to stand, they realise the cottage is on fire around them and with little chance of a way out. Hannah screams and Beth hugs her. Stephen walks in and Phoebe is in the middle of having a contraction. The boys are waiting for Stephen to come out of the toilet! Lou says that they can't wait any longer and introduces Serena - Siren of Sin! The lads all grunt and cheer as a dancer comes in and starts her act. As the dance goes on, Gaby comes over and interrupts. GABY: I'm sorry, Philip, but that was reception. The cottage out the back is on fire. He hurriedly rushes out of the pub with a load of the lads following him. Lou is dismayed that they're leaving whilst Serena is performing! Lou rushes off after them. Heywood has caught Cameron in the act and Cameron is being manhandled through the offices by his henchman, Noddy. Heywood is carrying a crowbar. HEYWOOD: You know too much for my liking, Mr Hudson. Show him the quick way out, Noddy. HEYWOOD: You see, we've been having a bit of trouble with our lift. Sometimes the doors open and the lift's not there. It can be quite dangerous if you're not careful. Let's show him! Heywood and Noddy hold a very scared Cameron over the lift shaft. HEYWOOD: You're very lucky because you've got a choice. See, I could use a smart boy with a good reputation. Even one that's too smart for his own good. In the light, we can see Cameron has been beaten up and has a bloodied nose. CAMERON: What are you saying? You want me to work for you? HEYWOOD: I like the old traditions, Mr Hudson. I'm making you an offer you can't refuse. Now don't let me down, else Noddy will have to let you down - very very quickly! Noddy feigns dropping Cameron down the lift, which causes a scared Cameron to yell out. The cottage is burning rapidly and Hannah and Beth are still trapped inside. 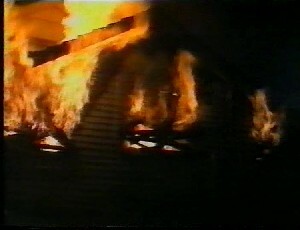 As the cottage is engulfed further in flames, Hannah starts to scream. 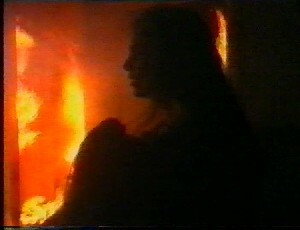 Seeing that the door frame of the way out is burning, Beth yells for help. The men are advancing towards the cottage and hear Beth's screams. BRAD: That sounds like Beth. PHIL: She's supposed to be babysitting Hannah. Brad runs forward into the cottage, pushing past Phil. 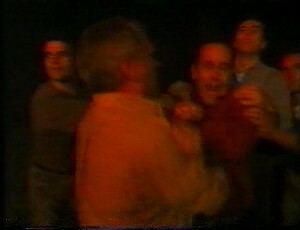 Lou yells at them not to go into the cottage and manages to hold Phil back. 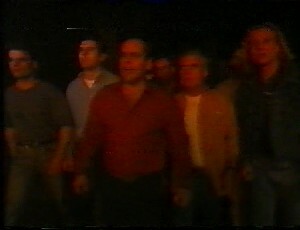 Between Lou and the other men, Phil is held back from following Brad. PHIL: Hannah! Hannah! Let me go! Hannah! HANNAH!